They rode the whole way along the street like that. Only letting go if a bike came up behind and wanted to pass. 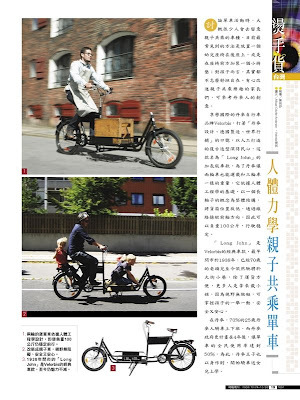 A spot of Cycle Chic in the China Times Weekly in an article about the Velorbis Long John cargo bike. Felix and I and a couple of friends in motion. I love that hand holding shot! I wonder if Flying Pigeon is prototyping a bakfeits right now? "I wonder if Flying Pigeon is prototyping a bakfeits right now?" I hope so, it can only be a good thing, cargo bikes for the masses. the bakfiets are made in china anyway, so why not?